I've always loved this gooseneck desk lamp because of the weight (almost 7 pounds). I hate a lamp that will tip over at the slightest touch. It is an all metal construction except for the buttons and cord. I am not sure of the age, because it was used when I bought it. It is almost a khaki color with a gloss. 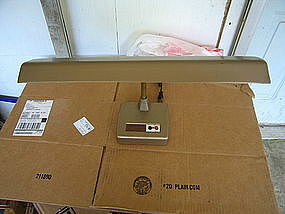 The hood/shade measures 19 inches across, the base is 6 1/2 x 5 1/2 inches and the height is 10 inches (excluding the hood). It has a red button for on and white for off. It is in good working order with the cord in an undamaged condition. There are no dents, but there are some superficial scratches. I hope to have complete condition photos available in the near future. I need your zip code to calculate the postage.